Some insider buying from the company's largest shareholders helped this burgeoning pioneer of targeted cancer therapies recover from this year's broad biotech selloff. What: Shares of Seattle Genetics (NASDAQ:SGEN), a biotechnology company developing targeted cancer therapies, gained 9.83% in March, according to data from S&P Global Market Intelligence. The news flow last month was relatively minor and included a request for confidential treatment of its amended agreement with Bristol-Myers Squibb. Previously, the company disclosed a reduction to the already low-single-digit royalty rate it pays Bristol on net sales of Adcetris and noted that the two had specified the agreement's termination date. While we won't know the secret agreement's details, there were hints of positivity in the form of moderate insider buying. 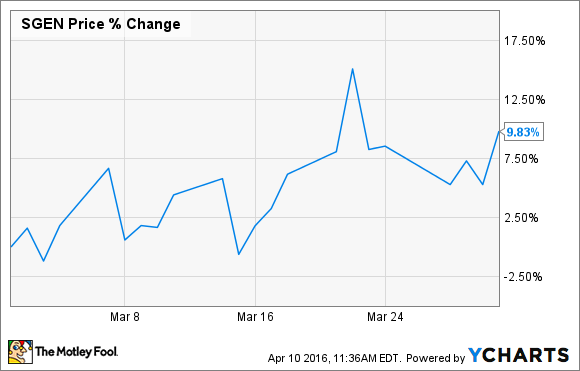 Baker Bros. Advisors upped its stake, from 26.7% as of Feb, 16 to 31.1% as of March 24. So what: There's an old saying when it comes to insider transactions: "There are a millions of reasons to sell, but only one to buy." While insider buying is generally a positive signal, blindly following insider purchases is ill-advised. You should know that Felix Baker has served as a director since 2003, despite requiring reelection every three years. The second and third largest stakeholders each own about 12.2% of the company's shares. This may have been an attempt to consolidate control, or simply a larger investment in a company with bright-looking future. Although undisclosed, the amendment to the Bristol-Myers agreement is probably also positive. However, I expect the company's burgeoning pipeline was a larger motivator of insider purchases, and the stock's gain. Now what: Its lead product, Adcetris, for treatment of Hodgkin's lymphoma has been stuck in the second line setting since its approval in 2011. A recent expansion last year to post-stem-cell-transplant Hodgkin patients helped push the company's top line 17% higher last year to $336.8 million. It's a good thing, too, because the company is also pushing hard to expand the Adcetris label to the front-line setting in Hodgkin's and other lymphomas with three phase 3 trials. The first two expected to finish could expand the Adcetris label somewhat. However, the largest expansion would come from the ECHELON-1 trial with advanced-stage but untreated Hodgkin's patients. It's measuring the standard four-agent regimen, against the three of the same agents, swapping Adcetris for chemo drug bleomycin. I'm afraid we'll have to wait a long time for meaningful results from this trial. Even when patients are diagnosed in stage 3, five-year survival rates for Hodgkin's lymphoma is about 80%. However, it's well worth the wait. With over 9,000 new cases diagnosed each year, Adcetris' inclusion in the first-line standard of care might be necessary to fund its rapidly expanding pipeline. The company's R&D budget was bigger than ever last year: $294.5 million. The good news is, the amount of data to be created over the next several years is even larger. While Seattle Genetics' R&D budget is relatively modest by big pharma standards, it's getting more than its money's worth. With more than 70 ongoing trials sponsored by itself, its partners, and independent investigators, it will be throwing off more clinical data than most companies twice its size in the years ahead.